For the first time, Porsche presents four driving examples of the 917 around the challenging Goodwood Motor Circuit – including the first 917, chassis 001 which has been restored just in time for this year’s jubilee. Furthermore, the 917/30-001 celebrates its debut after its restoration in Sussex. 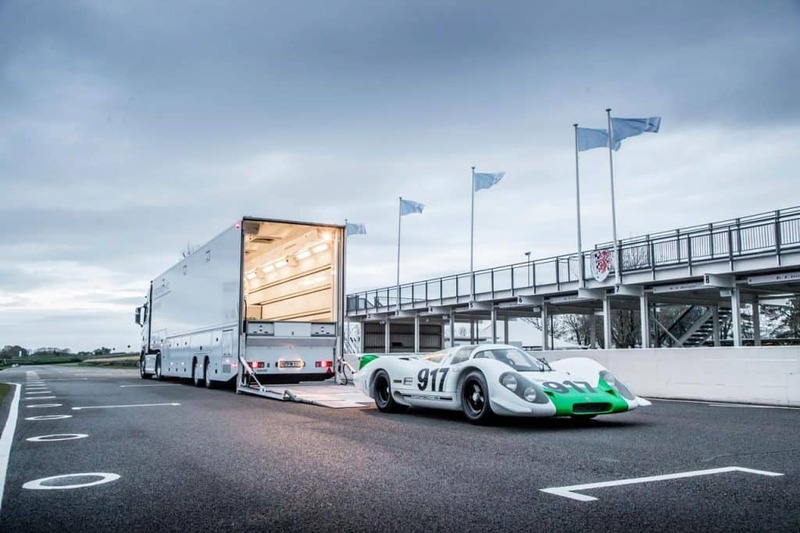 The 917-001 and the 917/30-001 meet for the first time at a driving event. Joining the first ever built 917 and the 917/30-001 will be the 917 KH and the 917/30 Spyder. One of the most iconic is the 917 KH short-tail car, chassis 15 in Gulf Oil livery. After having won the 24 Hours of Le Mans, the 917 short tail did it again the following year; carrying Martini Racing colours and the number ’22’ and with Gijs van Lennep and Helmut Marko sharing the driving it averaged 222 km/h and covered a distance of 5,335 kilometres – a record which stood for 39 years. The mighty ‘Sunoco’ 917/30 Spyder is a regular visitor to Goodwood. Developing in the region of 1,200hp from its 5.3-litre V12, the 917/30 Spyder weighs just 850kg – allowing it to reach a top speed of 375 km/h. With the engine suitably optimised, Mark Donohue set a closed-course speed record at Talladega Speedway in the sister car, to average 355.848km/h. Finally, the newest of the 917s at Goodwood is the 917/30 Spyder carrying the distinc-tive livery of 1975 sponsor, the central heating manufacturer Vaillant. Carrying a wheel-base extended by 184mm over the conventional 917, the car was built in 1972. The following year the car won on its debut, with Vic Elford driving, in the Interserie race in Hockenheim. Driving the cars at Goodwood will be Le Mans winners Richard Attwood and Neel Jani along with former F1 and LMP1 racer Mark Webber. Following Goodwood, the cars will leave the UK to re-join the Porsche Museum collection in Stuttgart. From 14 May to 15 September 2019, the Porsche Museum will honour the 50th anniversary of the 917 with an extensive special exhibition entitled ’50 Years of Porsche 917 – Colours of Speed’.